Eastward from Meridiani Planum, the flat ground that Mars Exploration Rover Opportunity landed on gives way to rougher, more heavily cratered terrain. Many craters found there testify to a long history of formation by impact, filling by sediments, burial, and exhumation by erosion. The unnamed crater in a new image, some 43 kilometers (27 miles) wide, lies not far northwest of the much larger crater Schiaparelli. Arcing across the top of this image is the northern rim of the 43-km crater, while a bit of its southern rim appears at lower right. 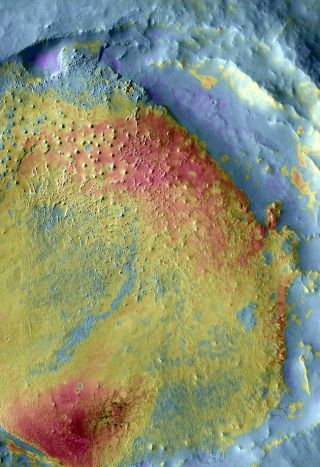 This false color image uses data from the Thermal Emission Imaging System (THEMIS) on the Mars Odyssey orbiter at Mars. It combines a daytime photo taken at visual wavelengths with a nighttime infrared view. Merging the two reveals areas that are dustier and sandier in bluish colors, while places with rock and hardened sediments at the surface are shown in reddish tints. Filling most of the crater is a huge stack of sediments whose yellowish color indicates moderately solid material lies at or close to the surface. The sediments are clearly distinguishable from rest of the crater's interior, where blue tints and softened, blanketed features suggest thick coatings of dust and fine sand. The crater formed by meteorite impact in the Noachian period, the oldest era in Martian geologic time. The Noachian extended from the planet's birth, 4.6 billion years ago, until about 3.9 billion years ago. Following the crater's formation, sediments accumulated within it, perhaps even filling the crater completely before erosion brought it to its present state. The sediments show at least two layers and stand about 1 km (3,300 ft) higher than the crater floor. Reddish colors show where rock-solid ground lies exposed. The tiny black patches indicate small accumulations of dark sand that have blown into drifts and low dunes. Both here and elsewhere on the sediment stack, ridges curve and divide. The origin of these is unclear: they may trace former channels where water flowed-or they might be ledges in thin sedimentary layers, now exposed by erosion. This reddish patch marks the northeast end of a long streak of dark material extending far to the southwest. This hints that winds have scoured the region and eroded the deposits here. A field of cone-shaped hills in the image are about 800 to 900 meters (half a mile) apart and roughly the same size. This part of the sediment stack is the thickest and stands highest in the crater. What are these? Good question! Although they look suspiciously like volcanic cones, close views from the MOC instrument on Mars Global Surveyor show features that don't suggest volcanism. Some of the hills, for example, appear to be yardangs, streamlined shapes cut by the wind. Yardangs occur only in relatively soft materials, not hard volcanic lava. While the evidence remains circumstantial, observations suggest these hills are wind-eroded remnants of a sedimentary layer. That fits the bigger picture, too. Scientists studying the region around Meridiani Planum see lots of evidence for a long sedimentary history in this part of Mars. The rock layers Opportunity has explored stand near the top of the sequence. They lie above layers that include the sedimentary stack seen here. Underneath that lies ancient, heavily cratered terrain. How much time is this in years? Impossible to say for now. The picture is complicated by the fact that sedimentary layers can erode away completely, removing all traces of the slice of time they represent. Until scientists have rock samples in hand that they can date, there's no good answer to this question. All around the edge of the sedimentary stack and extending onto the crater's floor, the bluish, dust-rich material shows many signs of small channels and depressions. Clues to these may lie in large climatic cycles. Scientists know that for much of its history, Mars has undergone changes in climate that cycle over periods of hundreds of thousands of years. In these climatic shifts, the polar regions-currently rich in water and ice-can warm enough to lose water to the tropics. If previous climatic cycles left deposits of dusty, ice-rich material, even at low latitudes such as here, then these depressions could be scars left when ice or water escaped and the ground subsided.